The history of Setnor Auditorium and of Crouse College is ingrained in that of Syracuse University, itself. Crouse College was built in 1888 and was the third building on what would become the Syracuse University campus. At the time, the goal was to create a coeducational university, where women were afforded an equal opportunity at higher education. Formally, the building is called John Crouse Memorial College for Women, but when it was opened in 1889, it had transformed into a completely coeducational school for fine arts, the first of its kind in the United States. John Crouse was a businessman and grocery store owner and native of North Syracuse. He died prior to the building's 1889 opening, and his son finished supervising the building's completion, and then named the building in his father's memory. It was designed by architect Archemedes Russell in a revival of the Romanesque style of design. The exterior structure is made of Longmeadow brownstone and supported by a stout granite foundation. The high roofs, gables, rounded arches, and dormer windows provide a general medieval character which is romantic and stately in nature. The interior is distinctively Romanesque with carved hardwood woodwork designs representative of the elaborate patterns of this period. Music and the arts have always flourished in Crouse College. Now home to the Setnor School of Music, Crouse College is an active, dynamic building bustling with dedicated music students of all types. 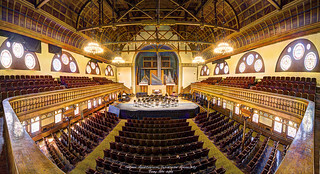 Setnor Auditorium offers many concerts each year by the students, faculty, ensembles, and guest artists of the Setnor School of Music. Setnor Auditorium was extensively renovated in 1998. The seats, floors, carpets, stage, and windows were all refinished and restored. This was due to a generious gift from the Setnor family, Rose, Jules, and Stanford Setnor. The music school and the Auditorium were renamed for the family. Individual seats were also sponsered at that time and each seat in the Auditorium is named for a family or individual. Setnor Auditorium is home to a magnificent Holtkamp organ, which replaced the Roosevelt organ that was installed in the original space. Crouse College also houses a ten bell carillon set which provides the area with three fifteen minute concerts each day. They are played by the ChimesMasters, a student organization run through the Music School. Crouse College has been listed on the National Register of Historic Places since 1974. Crouse College also houses the Winged Victory copy and several copies of art that are housed in Paris's Louvre and Pantheon. In the early days of Syracuse University, the fine arts department paid for copies of famous pieces of art for their art students to study art up close. These works now line the walls on the second floor of Crouse College. Crouse College is also home to glorious stained glass windows, most are original to the building and others were installed by Richard Wolff in celebration of Syracuse University's centennial celebrations in 1970. Setnor Auditorium boasts a 70-foot wooden ceiling which adds to the beauty and resonance of the space. Attending a concert in this beautiful wooden space, with sunlight illuminating the stained glass windows that line each side of the auditorium, is a transcendent experience, linking the room's atmosphere to the musical performance.